Protecting environmental quality while pursuing economic development poses a particularly difficult challenge to the countries of Central and Eastern Europe, where political and economic systems are changing rapidly following decades of environmental neglect and economic mismanagement. Advanced industrial nations also face difficult decisions about priorities and procedures for providing financial assistance to the region. 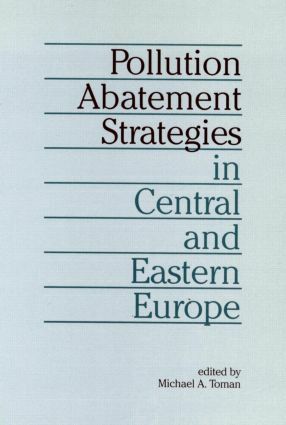 In order to identify workable solutions, Pollution Abatement Strategies in Central and Eastern Europe investigates some of the leading pollution problems that these countries now face and examines the link between economic restructuring and environmental improvement. Contributors to the volume assess the changes in the region's environmental conditions likely to result from economic restructuring and the benefits that might arise from improvements. They also consider the design of effective environmental policies for economies in transition, including the need to introduce or reform basic economic, legal, and regulatory constructs. Comparisons of incentive-based versus command-and-control environmental policies suggest that, despite the difficulties in implementing them, incentive-based policy options are worth pursuing in Central and Eastern Europe.